Did you all have the best Labor Day eva? I’d have to say that ours was the best I can remember in years. Typically we don’t do much or go anywhere for most holidays. You know, just hang out at home and enjoy the extra time off work, without fighting crowds and traffic. This year, however, J and I both had a long weekend so we decided we should take advantage and do something fun. Right after I got a new SUV, that is. I had a 4 day weekend, so I spent Friday at the dealership getting a new, shiny ride. Then Saturday we headed down to the beach, where J’s sister and brother-in-law have a beach house, in the shiny new ride. While the guys were out on the boat fishing, the girls hung out at the house, lounged by the pool, and had some drinks. It was perfectly relaxing and delightful. The whole group hung out in the evening, at some grub, and had more drinks. Driving home on Monday, notsomuch. Holiday traffic is the worst. Ugh. But we made it home safe and sound, which is all that really matters. 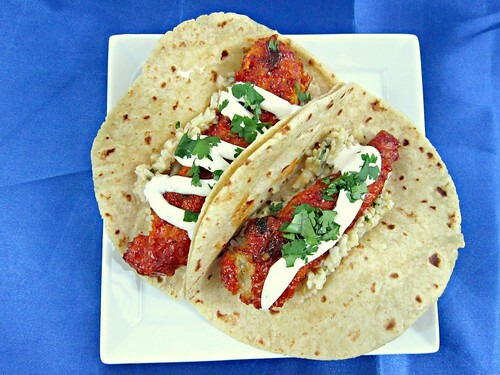 We had these tacos last week and holy moly, they were good!!! I mean, a sweet and spicy glaze over crispy chicken strips – what’s not to love??? Oh, and cilantro-lime rice, too, all rolled up in a taco! I was really pleased with how well this all held together. Sometimes when you try to toss breaded-anything in a sauce, it doesn’t hold up so well and you wind up with a lot of breading in the bottom of the tossing bowl, and not so much sauce on whatever was breaded. That was not at all the case with these chicken strips. The chicken was perfectly coated, browned, and crispy and when I tossed it in the sauce (and I tossed a lot to make sure every strip was evenly coated) I didn’t lose a speck of coating. Ok, maybe a miniscule spec, but no chunks. And then when I put those strips on top of cilantro lime rice, drizzled them with ranch dressing, and sprinkled more cilantro on top…in a tortilla, mind you…I thought I might have died and gone to Taco Tuesday heaven. I’d say this is one of my favorite tacos, recently. I wanted to eat all the chickens. But I shared with J, because I’m nice like that. And I know you want to be nice like that, too. Make these and share! Start your rice first as this usually takes about 45 minutes. Place the uncooked rice in a saucepan with your water or broth, bring to a boil, then reduce heat to a simmer and cover for about 45 minutes. Consult your package for specific instructions. Once the rice is done cooking, allow to cool for about 5 minutes, then add the cilantro, lime juice zest. Stir to combine. Preheat your oven to 450 degrees F, line a large baking sheet with foil or parchment paper, and spray non-stick spray. Set aside. Using three shallow containers, place the flour, salt, black pepper, and cayenne in one and mix well. In the second one, add the eggs and whisk. And in the third, mix the Panko and bread crumbs. One at a time, place each chicken strip into the flour dish, coating each side and shaking off any excess. Then into the egg, allowing the excess to drip off before placing into the Panko and pressing down so it sticks evenly on both sides. Place on the prepared baking sheet and repeat with remaining chicken strips. Spray lightly with cooking spray to help with the browning and crisping. Bake for 16-20 minutes, flipping halfway through, until chicken is cooked through, slightly browned and crispy. Meanwhile, prepare the sauce. Combine the honey, brown sugar, garlic, ketchup, pureed chipotles, hot sauce, apple cider vinegar, onion powder, and a dash of salt and pepper in a saucepan. Bring to a boil, stirring continuously. In a small bowl, whisk together the corn starch and water until the corn starch has dissolved. Add it to the saucepan, continuing to stir until the sauce has thickened, about 3-4 minutes. Reduce the heat to low until chicken is finished cooking. Place chicken strips into a large bowl, and pour the sauce over the top. Toss to coat all the strips with the sauce. 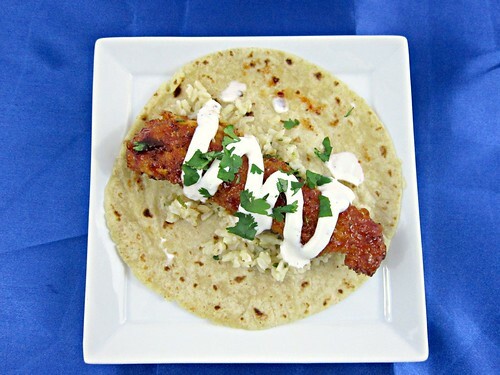 To prepare the tacos, warm your tortillas, then top with a few spoonfuls of rice, then a chicken strip (or two if you want), a drizzle of ranch, and more cilantro. Ready, set, devour!